Place ribs in large skillet or roasting pan. Cover with lightly salted water, and bring to a boil. Reduce heat to low, and simmer for 1 hour, or until meat is tender, but not quite falling off the bone. Remove from heat, and drain. Place the boiled ribs in a roasting pan, and cover with sauce. Cover, and refrigerate for at least 2 hours. Melt butter in a saucepan over medium heat. Cook the onion and garlic in butter until the onion is tender; remove from heat. In a blender, combine 1 cup water, vinegar, ketchup, barbeque sauce, and lemon juice. Pour in the melted butter mixture, and puree for 1 minute. Pour into a saucepan, and season to taste with salt and pepper. Bring to a boil, then remove from heat. Brush grill grate with oil. 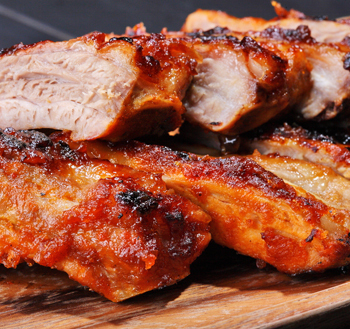 Grill ribs for 10 to 20 minutes, or until well browned, basting with sauce and turning frequently.